I can remember playing with mercury in the seventh grade. I was intrigued by this shiny, silver liquid. Students these days rarely get to see liquid mercury, not to mention touch it. Whenever I have an opportunity to let a student play with a small vial containing several milliliters of the liquid, I am always delighted at the interest and excitement expressed over this element. Mercury has been showing up in the news increasingly more, albeit negatively, and this has affected public perception of the element. Yes, mercury is a cumulative poison, and overexposure to it can occur by absorption through the skin, respiratory tract, or digestive tract. However, in my opinion this doesn't mean that we shouldn't have mercury in the chemistry classroom (although I believe my opinion is becoming increasingly less popular). Mercury is a "mischief maker" with "toxic vapors" reports one source. NIOSH has determined that the hazard level for mercury is greater than its potential usefulness in many schools' science programs. A third source said that mercury should "not be in schools except in small quantities and under lock and key." I have properly disposed of all but one small container of mercury (accumulated from broken thermometers over decades preceeding my teaching career and not needed in this quantity), and am slowly phasing out mercury thermometers in my general chemistry classes. I do however still use mercury when discussing density at the beginning of the year. I bring out one small, sealed container and allow my students to see it and pick it up. The mass of such a small amount of liquid amazes them! This past school year, after performing my usual liquid nitrogen demos, I happened to wonder whether I might be able to freeze some liquid mercury with my remaining nitrogen. The afterschool experiment that followed was recorded on video and shown to my students. They were intrigued at the sight of mercury in the solid phase. For my students, mercury was only supposed to exist in the liquid phase. If you feel ambitious I would encourage you to try this experiment yourself. (Note: mercury spills are especially hazardous because the droplets will scatter easily and often go undetected during cleanup, thus releasing vapors into air.) All that is needed is a small amount of mercury, two styrofoam cups, about 3/4 cup of liquid nitrogen, a test tube, and something to dump the mercury into once it has solidified (petri dish). However, if you have no access to liquid nitrogen and mercury, are prevented from using mercury in your school, or would rather not risk an accident, then you can contact me. I have converted the video to digital format, edited it for size, burned it onto a CD, added some instructions and notes, and am making it available to anyone who would like a copy for a cost of $5 USA (check or money order made out to Michael Geyer). The video comes in QuickTime and MPEG formats. 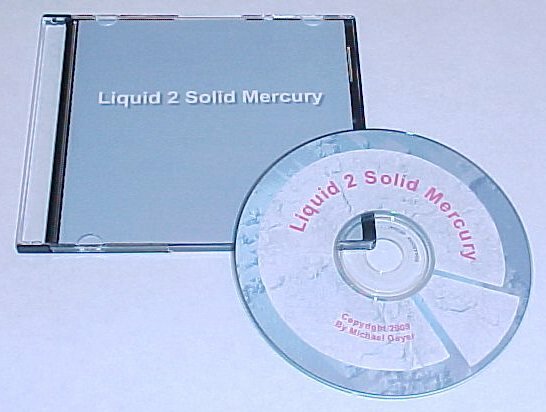 The QuickTime files were compressed in two different ways; the first allows the files to run on older, slower computers, and the second allows those with newer, faster computers to be able to enjoy a better quality video. A sample of the video is available for viewing. Please keep in mind that the quality of this sample video will not be as nice as that of the video on the CD, as I had to keep the sample video file size small to allow it to be quickly transferred over the internet. If you have any questions, comments, or suggestions about the video please feel free to contact me. I hope this information proves useful in helping you reach a few more students, and that you enjoy using it as much as I do.